Horizon Group Properties and CBL & Associates Properties partnered to open the outlet mall in the Woodstock area, north of Kennesaw at I-575 and Ridgewalk Parkway. Horizon also operates "The Outlet Shoppes" branded centers in a assorted other locations including Oklahoma, Texas, Pennsylvania, Indiana, Wisconsin. Measuring 370,000 square feet, The Outlet Shoppes at Atlanta is the largest "new build" outlet mall since Discover Mills (now Sugarloaf Mills) opened in Lawrenceville in late 2001. For reference, Sugarloaf Mills measures 1,200,000 square feet but includes multiple large anchors such as AMC Theaters (over 74,000sf), Bass Pro Shops Outdoor World (over 120,000sf), Medieval Times (over 87,000sf), Dave & Buster's (over 61,000sf) and Burlington Coat Factory (nearly 80,000sf). These anchors alone total more than 420,000 square feet and are only the anchors of the center that has about 200 shops, more than double The Outlet Shoppes at Atlanta's tenant count. Georgia is also home to Calhoun Premium Outlets, off I-75 to the northwest, North Georgia Premium Outlets, off GA 400 to the north and Tanger outlets in both Commerce, off I-85 to the north, and Locust Grove, off I-75 to the south. While I would love to welcome an outlet center like Sawgrass Mills (Sunrise, Florida) or Woodbury Common Premium Outlets (Central Valley, New York), The Outlet Shoppes at Atlanta are far more basic. Billed as an outlet center, The Shoppes at Atlanta is believed to be be following a growing trend in outlets where there is a mix, sometimes as much as 30%, of retail priced stores vs. "outlet" priced stores. Stores like Famous Footwear, Kitchen Collections, and Love Culture are all perceived as value priced and are therefore perfect fits for a center attracting shoppers looking for deals, even if they aren't actually outlets. Another growing trend in retail is for retailers to produce or purchase product especially for their outlet stores. Knowing the centers bring in a certain demographic of shopper, the retailers can mix in this "factory" product to existing product that actually came from full line stores. This practice likely started as a way to maintain a consistent product assortment, but for some retailers it has led to significant amounts of their "outlet" offerings to be anything but. Two of the best examples of this practice are J. Crew and Saks Fifth Avenue OFF 5TH. J. Crew merchandise that is made specifically for the outlet is distinguishable by two small stars sewn into neck tags - this marking tells you this exact item was never for sale in a full line J. Crew store. If you want "real" J. Crew deals, check out their "clearance center" in Arden, North Carolina or their semi-annual warehouse sale where you can get ridiculous deals on all J.Crew lines including crewcuts, Madewell and Mens Shop. There is of course some factory merchandise, heck, even some "samples," but the deals are insane and Asheville is close so you can make it a fun weekend. Saks is a little trickier with their merchandise and they contract with third party vendors to produce outlet exclusive merchandise that they mix in with merchandise from full line Saks stores. This will be Saks's third metro area store (others being at North Georgia Premium Outlets and Sugarloaf Mills). This one will, however, sport the chain's new "luxury-in-a-loft" layout which “highlights the merchandise and facilitates easy shopping. The modern, uncluttered layout includes an open floor plan, moveable fixtures and bright lighting." Today there are over 65 OFF 5TH stores and an ever shrinking number of Saks Fifth Avenue stores, just over 40 at last count. In recent years, Saks has ramped up OFF 5TH expansion while closing flagship stores in San Diego, California, Austin, Texas and Portland, Oregon, among others. While the 28,000 square foot OFF 5TH will "anchor" the center, a number of other notable retailers will call The Outlet Shoppes Atlanta home, including True Religion, Under Armour, Kate Spade, Juicy Couture, J. Crew, Brooks Brothers, Waterford, Yankee Candle and Columbia Sportswear. Ghiradelli Chocolate will open what I'm told will be a store and cafe in the center, the first of its kind in Atlanta. Ghiradelli, based in San Francisco, operates its flagship cafe in San Francisco, and also a wildly popular satellite location location at Disney Downtown in Orlando, among other cities. Ghiradelli will be giving the south a second shot after closing their store at The Outlet Shops of Grand River near Birmingham, this past December. The chocolate shop opened with the mall in late October 2010, but apparently did not meet expectations. The Outlet Shops of Grand River shares a similar tenant mix with the upcoming Atlanta project but is slightly smaller at 330,000sf. Taqueria Tsunami and Cupcakelicious will both open second locations in the food court of the center. Taqueria Tsunami's first location on Peachtree Road in Buckhead closed last year, but a second location in downtown Marietta remains open. Cupcakelicious has one location in Woodstock and plans to augment their menu at the outlet center with planned additions of coffee, chocolate, bagels and possibly, ice cream. A whopping 23 retailers opening in the center are listed under "footwear". Among those listed are the usual suspects like Nike and Adidas, as well as Puma, Skechers and Converse. Stores such as Journeys, found in most any mall and unlikely to be offering "deals," is also opening. G.H. Bass Co., Naturalizer, Fox Head and Clarks are among the more "exotic" footwear openings. Interestingly, the Shoppes at Atlanta website reflects there being both "ECCO" and "ECCO Outlet" stores in the center. It would be very odd for there to be both in the same center. If there is, as I suspect, only one store, it is a "relocation" from North Georgia Premium Outlets, where the ECCO store closed July 2nd and said they were "moving to Woodstock." A source at North Georgia Premium outlets reports having heard that Brooks Brothers consolidated multiple storefronts into one at the Dawsonville outlets to justify opening in the Woodstock center. Additionally, that same source indicates having heard chatter among existing NGPO tenants that they may bolt if the Shoppes at Atlanta gain traction and or if opportunities present themselves to relocate. There was also a rumor earlier this year that Bloomingdale's would bring their first Atlanta area outlet store to the center but that rumor appears to have been false. There are far more neighborhoods and families in the area surrounding the Shoppes at Atlanta than surround the Dawsonville center, which receives heavy international tourist traffic. With wealthy east Cobb residents close by, not to mention the tens of thousands of students of Kennesaw State and the under-retailed Woodstock area, The Shoppes at Atlanta could end up surprising some. Will you make the trek to this new outlet center? Has the word "outlet" been ruined by stores that offer "factory store" merchandise? What store could be added to the Outlet Shoppes at Atlanta to make you check them out? When did Woodstock become Atlanta? The "at Atlanta" label for a project located in Woodstock is nothing short of fraudulent. I was waiting for this to be asked / mentioned! I totally agree! Is Woodstock not in metro Atlanta? I am not impressed with the stores that are opening and will probably not go out of my way to visit. yay for more shopping in ATL! Good write-up Eli. I'm amused that I have been to both Sawgrass and Woodbury Commons. Woodbury is awesome. Funny about the J Crew store in NC. I need to see that. When will the traffic upgrads occur? No traffic signal at the exit from 575 heading south. Being a long time resident of the Woodstock/Kennesaw area it is sad to see the beautiful woods destroyed by more shopping malls. The Town Center area had plenty of old and/or unused buildings that could have been renovated into these new stores. Also Woodstock is not Atlanta and this just brings unwanted crime into the area stating it is part of the metropolitan area. I personally hope the person ultimately responsible for the ideas, planning and developing the Shoppes (spell check, maybe?) of Atlanta gets diarrhea for the rest of their lives. Both outlets will be fine and will attract customers from different areas. Here's the thing, the north ga area has NOTHING in the way of shopping, and many of these people patronize the Dawsonville outlet and will likely check out the Outlet Shoppes at Atlanta as it's a better drive. For Atlanta residents, I really think it will depend on which side of town you live on, as it sounds like they're pretty much the same. Good article, Eli. There's a longer backstory about Woodstock's Ridgewalk area. I don't know as much as I probably should. But originally this area was supposed to have an "Avenue" property. Woodstock hoped it would complement what they put together in their downtown. The intersection was built, form-based zoning code put into place, etc. Since then the economy tanked, developers went under and a lawsuit or two made headlines. 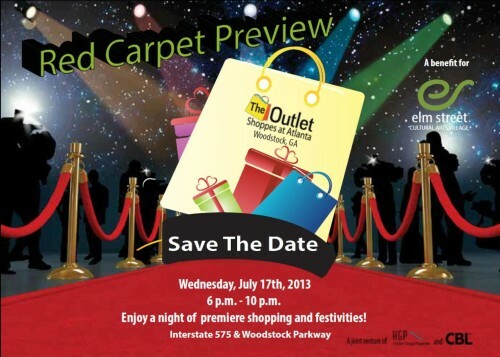 Today Woodstock is left with an outlet mall, albeit a nice one, it is much less than what they originally hoped for. And as an aside, a few of those planners from Woodstock now work for Alpharetta. Thanks for the catch! The change has been made. One of these days I'll actually make it up there! Lee - the avenue backed out when cousins decided to stop building that concept and 'partnered' with the developer of the outlet mall, then left altogether. The form based code was adopted at the desire of the citizens to see something meaningful planned for the area instead of seeing the lack of vision that the developer had (which was none). The outlet mall was not built under the form based code, although the new local campus of North Pointe Church will be...form based codes are not entirely bad for communities (especially when 200+ residents participate and support the process and vision). My point was that this area didn't turn out like what some had hoped. Wasn't trying to make commentary on form-based code, but I will if you want. I've yet to see FBC work in the northern burbs. Guess we'll see how Roswell and Woodstock do with it. Also think clever consultants, using the delphi technique in the charrette process, can get anyone to go along with with anything. No point in debating or commentary on form based codes. Residents requested the plan be done, participated in the process and were generally pleased with results. It is definitely to be determined to be successful in the suburbs but the success of downtown Woodstock (continuing under a FBC) is good, not without growing pains, but good. I do agree they aren't necessarily good in all places...TBD. I believe an outlet mall will be better than another Avenues. That is, if there are really outlet stores there and not just name brand stores that sell merchandise they don't sell in their full retail stores. Cherokee County has been part of Atlanta's MSA for more than 30 years and will continue as such. The MSA includes 10 top counties, of which Cherokee is one, and an additional 10 more counties.